Trains station of Manhattan that do not exist any more is probably a better title. The Hudson River Railroad reached Albany by 1851. Cornelius Vanderbilt was told he was crazy putting a railroad so far over on the west side of Manhattan. He said something along the lines of "build it and they will come". I am not suggesting the man had seen Field of Dreams but he saw the future. 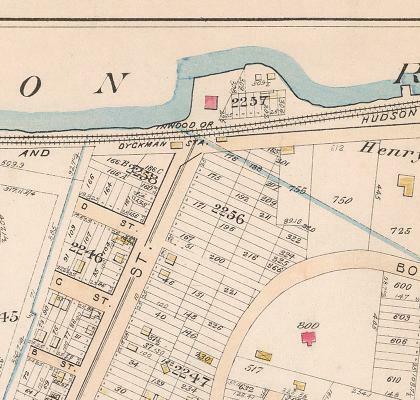 He was right and a neighborhood sprung up near the tracks, a neighborhood eventually bordered not only by the Hudson River and what became the Hudson Division of the New York Central, but also the 9th Avenue Elevated. The Harlem River line, the line that runs up what we now call Park Avenue, had passenger stations at 59th street, 86th street and 110th street in addition to the 125th street station. These areas of sparse population were eventually going to grow as the city marched north. Mr. Vanderbilt's railroad along the Hudson River also saw the potential. Like the Harlem River Railroad, along the way up the river passenger stations were built at 96th Street, 130th Street, 152nd Street (for the development called Carmansville) and at Inwood. 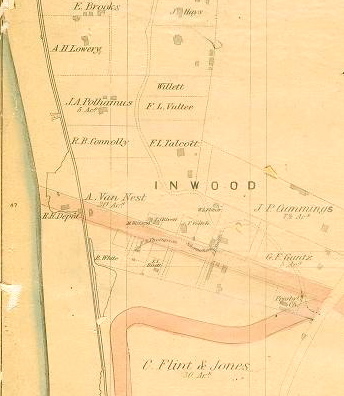 This is a map from 1867. The grid of 1811 is visible in an area that would not see too much in the way of the grid. The tracks are there and so is the station. In 1864 Cornelius Vanderbilt took over the Harlem River Rail Road and another railroad upstate called the New York Central. By 1867, he merged these roads together calling this uber railroad, The New York Central. Some of the streets are gone or renamed. The grid lines have faded but the station is still there. 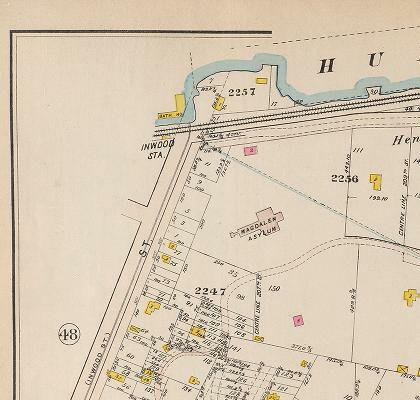 This is a map from 1897 and the station is called "Inwood or Dyckman Station". The street that we now call Dyckman was once upon a time known as Inwood Street. This is a map from 1911. Dyckman Street is Dyckman but the memory of it being called Inwood Street lingers, in parenthesis anyway. The station is called Inwood and was still seeing service as a passenger station at this late date. The building in the center would eventually become part of a scandal concerning the abuse of the young women who lived there, poor single girls and a park would eventually envelope the site, but more on that later. Small town America? Small town Manhattan. I have always said that Manhattan's neighborhoods are like a bunch of small towns strung together by a grid. Harlem was a separate village and so was the village of Greenwich. This is Inwood and this is the station that served the area before there was a subway to fill the rapid transport needs of this community. What is now Dyckman street is on the right and the road going up the hill in the center of the picture is now in Dyckman Field and Inwood Hills Park. The road is gone, the tracks were elevated in the early 1920's and no trace remains of the station.